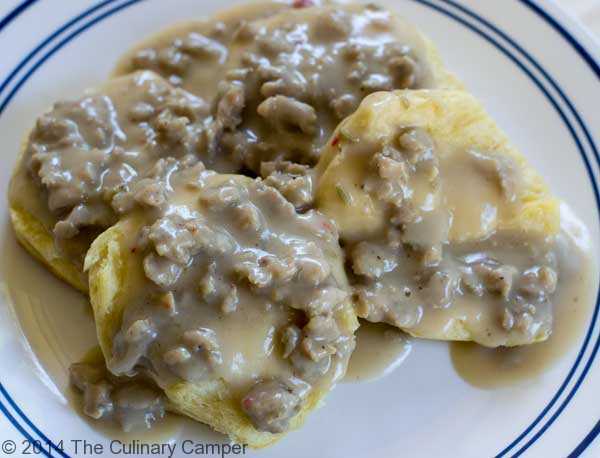 Biscuits and gravy are a great addition to any camping breakfast menu. This is a particularly great breakfast item if you have a busy active day of hiking ahead of you. This breakfast will stick to your ribs so you are not hungry an hour later. While this recipe for biscuits and gravy is mostly from scratch you can also consider, making this even more simple and fast by using a packaged gravy mix. I prefer to do my gravy from scratch, however, because I can control the amount of salt and other spices that go into it. When it comes to the biscuits I often used canned biscuits for ease. Making home make biscuits is fun too. I highly recommend the cooked sausage be added to the mix. A little sausage really adds that little something to the flavor of the gravy. Just be sure taste the sausage gravy before adding salt. Sausage can add quite a bit of saltiness to the gravy so you don’t want to overdo it. Chicken sausage is also a nice variation on this dish as the chicken sausage is a bit healthier than pork. I love to eat biscuits and gravy is with a couple of eggs slopped over the top. I’ve seen this dish served in several creative ways. One of my favorite ways was named the B.O.B. which stood for Breakfast On a Bun. The B.O.B included two strips of bacon, a sausage patty and a slice of ham on top. Lastly, an egg topped the whole thing before it was smothered thickly in gravy. Another great variation is to use chicken sausage instead of pork sausage and make the gravy with alternative oils instead of butter. While this is tasty and somewhat healthier, butter does add some great flavor to the gravy. 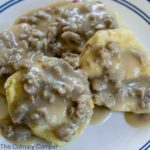 No matter how you might like to mix and match your breakfast on a bun this recipe will give you a good foundation for biscuits and gravy that everyone will love. This family favorite is warm and comforting on those cold mornings. Treat your family this weekend to a great hardy breakfast of biscuits and gravy. Place biscuits in an oven at 350° or a 12-inch Dutch oven and cook at 350°. If cooking over a fire, use 17 coals on top and 8 on the bottom for 15 minutes. While the biscuits are baking, place a sauce pan over a stove and melt the butter or oil. Once the butter is melted, whisk in the flour and cook for about 3 minutes on medium heat. Slowly add the broth and bring to a slow simmer, simmer for 5 to 10 minutes or until the gravy begins to thicken. Add salt and pepper and cooked sausage if using, and cook for one more minute or until sausage is heated. Remove from heat and stir in milk, if the gravy is too thin you can eliminate this step. The milk does, however, give it a nice creamy "country gravy" flavor.